iradiophilly | Culture - Firefly Music Festival Announces Details of Big Break Live Contest; One Spot Left for a Local Band! Firefly Music Festival Announces Details of Big Break Live Contest; One Spot Left for a Local Band! DOVER, DE (March 31, 2017) -- One more slot has opened in this year's Firefly Music Festival lineup, and festival organizers are looking to fill it with regional talent. 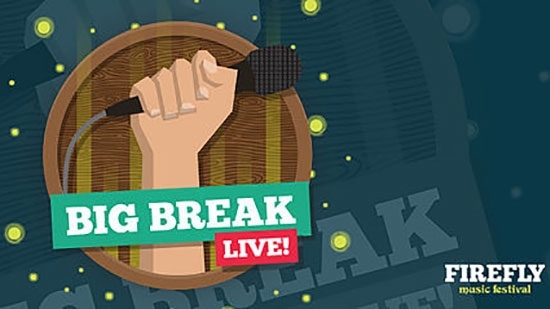 Red Frog Events, producers of Firefly, and REC Philly are partnering to bring Big Break Live to life. The inaugural contest and showcase is a regional addition to Firefly's national Big Break contest. By submitting an online application, regional artists will have the chance to play a set on a Firefly Music Festival stage. Musicians will go through three rounds in order to win: round one to help discover the top 25 acts from all the submissions, round two fans will vote online to narrow it down to the final five, and in round three, the final five will compete in a live showcase in Philadelphia. One lucky winner will join the other 135+ artists and bands at The Woodlands in June to play on one of Firefly's seven stages. The winner of Big Break Live will then go on to play on an official Firefly stage. Benefits for the winner include a content piece created by REC Philly (which will be promoted on Firefly's social media platforms), a travel and food stipend, and artist credentials for the duration of Firefly Music Festival. Red Frog Events and REC Philly are excited to partner to bring a more local feel and more opportunities for fan engagement to the largest music and camping festival on the east coast. The collaborations works to bring attention to local bands, not only through Big Break Live, but by booking 13 local acts to play Firefly's first Northeast Rising Showcase. To help musicians with the Big Break Live application process and create the content they need to fuel their campaigns, REC Philly will be hosting an open house at their "REC Room" studio in Philadelphia from April 1 to April 4. For more details, contact REC Philly here. Firefly Music Festival is the east coast's largest music and camping festival, taking place annually in The Woodlands of Dover, DE. Firefly is the first-ever fan curated music festival. The Firefly community shapes the festival experience by voting on major decisions including attractions, artists, experiences, designs, and more. In The Woodlands, attendees enjoy amazing performances from their favorite musicians, explore new activities, spend the late nights with friends in the campgrounds, and make memories that last for a lifetime. The 2017 festival will take place June 15 - 18 and features headliners The Weeknd, Muse, Twenty One Pilots, Chance the Rapper, and Bob Dylan and His Band, as well as 125 additional acts. Visit FireflyFestival.com for more information. Red Frog Events is an event production company and pioneer of the experiential entertainment industry, recognized for its award-winning company culture. Since 2007, the company has developed innovative brands including the Warrior Dash obstacle race series, Firefly Music Festival, and Chicago Beer Classic. Red Frog also provides event services ranging from food and beverage to its ticketing platform, EventSprout. Red Frog has been named one of Forbes' "Most Promising Companies in America", has appeared consecutively on Inc. Magazine's "Fastest Growing Companies" list, and was recognized on Chicago Tribune's "Top Workplaces" from 2011-2014, among other honors. In recognition of its philanthropic efforts, the company was selected as St. Jude Children's Research Hospital's "Corporate Partner of the Year". To date, Red Frog has raised over $13.5 million of a $25 million dollar fundraising commitment to St. Jude and in 2016, announced a one percent profit donation to the organization. Visit RedFrogEvents.com for more information. REC Philly is Philadelphia's Creative Incubator & Agency, helping musicians & creative entrepreneurs build & monetize their passion projects since 2013. REC operates a 3-room creative facility in Philadelphia, called the REC Room, which is made up of a recording studio, media lab, and a co-working space. They also operate a 300 person music venue & event space in West Philadelphia called, Live! at William Street Common. REC is responsible for booking 13 local artists at this year's Firefly Festival. They also are involved with powering Philadelphia's presence at South By Southwest (SXSW) for the past three years, under the brand name "Amplify Philly". They also have ties with producing media & events at festivals such as Made In America in Philadelphia, and A3C in Atlanta. Creators can be involved with REC Philly by subscribing to their membership program, which allows access to their spaces, service network, educational workshops & events, booking & content opportunities, and much more.